Navigate: StoreFront / Track Car Safety Equipment / Harnesses / TRS Harness "Nascar"
A rugged and simple design popular with oval track and drag racers. Uses a lever type latch and link release buckle. Available in 4, 5 or 6 point fixing with 50 or 75mm webbing. 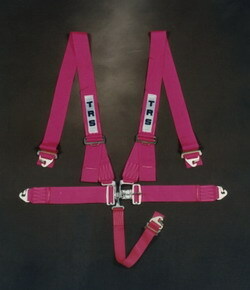 *** NOTE *** We do not generally stock 4-point harnesses as we do not recommend them. Two types to suit saloons or single seaters with a variety of end fittings. Comes complete with eye bolts and is available in 7 colours. 75mm approved to SFI. Black, blue, and red harnesses are held in stock, but, the colors green, grey, pink, violet, yellow, and orange and available through special order. Please feel free to call for additional colors or any questions you may have.